While refinement in sequels is undoubtedly a good thing, and is to be expected, it can also have its downsides, at least as far as this generation of The Sims goes, because in this case, such refinement has seemingly left little room for truly innovative or game-changing expansions. 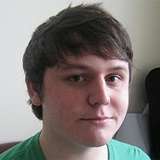 When the Sims 2 University expansion was released for the game’s second iteration, back in 2005, it brought with it a wealth of new features, the most notable being a whole new age bracket, extending your Sims’ lives and throwing them headlong into the uni life, with new features, opportunities, and interactions. It was exciting, enjoyable, and one of the best expansions (at least, in my opinion) that Sims 2 saw. Spool forward to The Sims 3, and this generation has been dragging somewhat, hampered by numerous gameplay issues, glitches, dissatisfaction at EA’s near-extortionate Sims Store, and a roster of lacklustre, cheap-feeling expansions. While Maxis were slowly churning out new pieces of the Sims universe, University seemed like a glaring omission until, finally, it arrived to be the tradition-breaking ninth expansion. This time, however, if doesn’t feel half as exciting or enjoyable and I was left feeling somewhat underwhelmed. The Sims 3 University Life sees a whole new world open up for your Sims, as the chance to head off to uni for an honest (or not) education beckons. This time, in what is one of the expansion’s more inspired moments, it isn’t just young adults who can reap the benefit of higher education, as Sims of any age from young adults up to elders can pack up their togas and Deathmobiles and head off to the university campus. Enrolling in uni is blissfully easy, with Sims able to use any PC or the powerful (if mind-bogglingly function-packed) smartphone. All eligible Sims can be moved to the uni panel, and then majors, term length, and number of credits can be selected. This time around, however, uni costs cash, and even a couple of Sims will set you back a few thousand Simoleans per term – nothing that selling the goldfish and granny’s favourite vase won’t fix though. The list of majors on offer was oddly limited, with a rather dull choice of six to chose between: Business, Technology, Science and Media, Fine Arts, Communications, and Physical Education. Each degree is geared towards specific careers and professions, so it’s crucial to choose wisely if you have a specific path mapped out for your Sim. 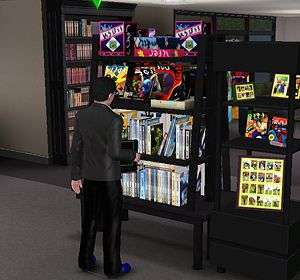 For those Sims who are more freewheeling characters, for whom players have a more freelance or boho lifestyle planned, away from the traditional career ladders, players will have to take a closer look at the degrees on offer to find the one that best suits them – especially for Sims who have a Lifetime Wish for non-career related things, such as having a Private Museum. Once the important decisions have been made, it’s time to pack up and head to campus, where you’ll be given the choice of where to live: fraternities, sororities, dorms, or private rentals, with the latter being the most expensive option and dorms being the cheapest – i.e. free. It was with the living accommodation that I got my first big shock: gone are the poky, strapped-for-cash student dorms of Sims 2 University and in were huge sprawling dorm buildings, with everything you could ever need spread out over three well-styled floors. While the ample space, tasteful (if somewhat gloomy) European styling, and wealth of entertainment – not to mention vast garden – made life easier, I found it removed much of the fun and challenge of uni living. Arguably, by having everything handed to you on a plate, you can focus on juggling the academic and social aspects of the game without worrying too much about cash for exercise equipment and consoles, but personally I found the experience a little soulless. For me, part of the fun with the previous generation’s title was the slightly impoverished, but cobbled together, uni experience, with Sims churning out counterfeit banknotes and working as lackeys in the dorm kitchen to be able to afford that plasma TV. It gave it a realistic feel, somehow, that was sadly lost here. Still… no need to save up and shoehorn PCs into every tiny corner of the dorm now – although I daresay that the uni admin people wouldn’t have approved of the monstrous inventing bench that I jammed into a corner of the once-dignified study room. Talking of cash, this being uni and students being what they are, well-stocked house or not, there will always be something to spend money on, whether it is coffees at the new java hut, Roasted Toasted Beans, crappy candy bars from the second game’s returning vending machines, or expensive skill books and recipies. If you spent your last Simolean sending your darlings to college, then clearly cash will have to be earned somehow. This time there is only a poky dorm kitchen, with no plates of slop made by a jaded kitchen worker whom you can replace, so you’ll have to find other means of employment. Thankfully, there are a number of options, the biggest being the ability to go to the local admin centre and ask for additional funding. Depending on your academic performance, this can net you a tidy sum of cash to keep you in comic books and coffees for a good while. Other options include selling exam cheat sheets, garden produce, and collectibles (good luck finding many, there seemed to be an unusually dire lack of ore/gems/seeds on my campus), or checking out the job board outside your dorm – a welcome inclusion. This board works in a similar way to the Adventure Boards in World Adventures, whereby there will be a selection of odd jobs to chose from, each paying a varied price for things such as organ donation, videogame testing, and various fetch quests. With home comforts sorted, it’s time to get with the program and knuckle down. The career panel in the HUD is swapped out for a near-identical academic one, which charts your classes and exams and features your academic performance meter. It is essential to keep this bar as high as possible if you want a good grade in your final exams, as it has a lot to do with your resulting grade (as does being well rested and in a good mood). It can be kept up by attending classes and lectures, studying, and participating in degree-related activities, such as refining your writing skills (as part of a communications degree), but it does seem to drop alarmingly fast at times (at least it did for one of my Sims). In addition, you will be given a special study object, specific to each degree, that can help boost academic performance – again, for my communications major Sim, this was a portable radio station, from which he could report on campus events or run ads for some extra cash, while my Fine Arts Sim had a sketch book that he could whip out whenever the mood took him (although in his case the inventory quickly filled up with sketches, which then had to be sold off one by painful one). As far as extra studying goes, out are the blue assignment books and term papers that you can influence other sims into doing for you (more’s the pity) and in is the catchall of ‘studying’, which can be completed pretty much anywhere, thanks to your Sims’ smartphones if you don’t fancy finding a PC. All this academic cramming will eventually amount to something pretty useful, as it means that your freshly educated Sims can enter a degree-related career at a higher level of pay. One aspect, which was something of a relief, was that while some classes took place in the game’s hated rabbit-holes (albeit aesthetically lovely ones), lectures could be player-attended, and your Sim had a number of interactions to perform for the duration of these, including taking notes, asking questions, or sleeping through the whole thing – it was a welcome antidote to Sims vanishing for hours at a time and made me yearn for more of it across the entire Sims 3 board. University Life’s other key feature is the social aspect – if you’re like me the word ‘social’ will induce shuddering, but if you like to play a bed-hopping/party going social creature then the game will shine here. The aforementioned smartphone brings with it a host of modern networking features and interactions, from sending someone an insulting text, to posing for pictures with mates and arranging parties – all of which can be daunting at first, but are useful to a greater or lesser degree depending on what type of player you are and how social your Sims are. The number of social interactions has been increased further in this expansion, and this is helped in no small way by the new social groups element. Groups are the Jocks, Nerds, and Rebels, all of whom come with their own specific interactions and abilities which are unlocked by gaining influence within those specific groups. This can be done by befriending, impressing, or otherwise buying your way up the social ladder – something that can be done all too easily (thankfully, for those just after the bonuses) by using the cheap but effective Lifetime Happiness rewards. 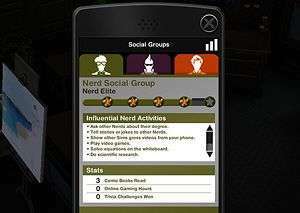 There are ten levels in each social group, each with their own title, and they come with some interesting abilities and interactions; Rebels gain the ability to sell cheat sheets and organise protests, while nerds can boast about their gamer skillz and play games online with friends. If you aren’t socially minded, then this inclusion will be of little interest to you… bar one thing: the extra trait slot. Yes, when creating a Sim for the first time, one of the hardest things to do is often to select which five of the many traits on offer that you want to fold into your Sim’s character mix. Well, thanks to Uni, there are two extra trait slots up for grabs – one of which is unlocked by reaching level eight in any of the social groups. Sadly, reaching level eight in all of them will do you no good, as hitting it in any additional groups will only give you the chance to change the social trait that you already selected the first time you did it. I tried. Believe me. The other trait slot comes with graduating from uni – easily done – but for me, the social slot was the only real reason to bother with the social groups feature which, apart from a few perks, felt as unnecessary overall as the whole celebrity thing back in the Late Night expansion. 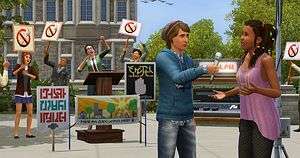 Really, when it boils down to it, there is little that groundbreaking or diverting about The Sims 3 University Life. While some things have been tweaked, and a handful of new baubles thrown into the mix, it is much the same – and pretty pedestrian – with some changes, additions, and omissions that may or may not sway veteran players one way or the other. Influence remains missing – although you can convince Sims whom you know well to do a few things for you – but it is perhaps just as well, because if the HUD sprouted any more additions it would likely collapse like an overloaded shelf. A number of old objects make a return to accompany the new ones, along with some entertaining deaths (watch how often you shake that vending machine), while other things/interactions are sadly absent (the ability to screw your professors for more academic performance springs to mind). Overall the whole thing just felt a little flat. While most of the expected Uni features are here (and many of my minor gripes can be overcome – you don’t have to delve into the barrage of social stuff if you choose, although that is one huge half of the expansion, and you can strip back the dorms or build your own if you want your own poverty story) it just felt uninspired somehow. Which brings me back to my opening paragraphs. 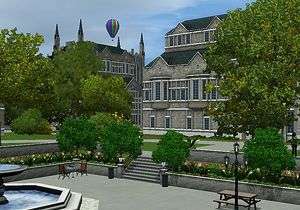 It’s been a good many long years since Sims 2’s University expansion and this one – much has been tweaked and refined with the game in this time, so there is ultimately little that The Sims 3 University Life can really offer up. Nothing game-changing anyway. Ultimately this expansion is more of the same, a little dull, and with not as much under the hood as one would hope for. I wanted it to shine, to make me want to pour as many endless hours into it as I did its predecessor… this time, I just milled around, slightly bored, feeling somewhat let down. If you are looking for Sims Uni for this gen, then this is it, but just don’t expect to be blown away or given a huge box full of new gameplay trinkets and wild surprises. This ain’t Animal House… it’s how I imagine Frasier Crane’s time at Harvard to have been: worthwhile for the outcome, ultimately productive, but as exciting as polishing shoes. They are entertaining shoes, mind, even very functional and with occasional touches of good craftsmanship, but they’re just not ones I could walk a thousand miles in. The Sims 3 University Life is a tough one to describe. On one hand, it finally brings the university experience back to the Sims franchise after a very long break, which is a welcome thing, and it does a fair job. On the other hand, it is sadly lacking - there was no real inspiration, nothing game-changing or even overly entertaining. The raft of social features and interactions will no doubt please players of a certain disposition, but the social groups feature, of which much has been made, was somewhat trivial, and only worth the time of day thanks to the dangled carrot of an extra trait slot - of which two can be gained in this expansion, which is perhaps one of its bigger draws. As expected, there are some great interactions and objects, including some returning favourites, and even a couple of amusing deaths to spice things up for more sadistic players, which are always welcome and can be fun to discover. In addition, the jobs board makes earning cash a little more diverting than slopping out bowls of cereal in the dorm dining room, which makes sense, given the arguable success of a similar feature in World Adventures. Deserving of more of a quiet round of applause than a triumphant fanfare, The Sims 3 University Life offers an entirely reasonable and perfectly acceptable expansion, but there just aren't enough interesting or entertaining layers to peel back, and those there are aren't enjoyable enough to rival the feelings inspired by Sims 2's version. That said, this expansion is a safe pair of hands and certainly more worthy of praise than some of its predecessors. How excited are you that you only have to wait a couple of years to review it all over again for Sims 4?